With America’s newfound attention to conquering space still in its relative infancy, it’ll be a few more years before a new class of astronauts implants their names and achievements in our minds. (Not that I’m trying to downplay the hardworking astronauts of today, but society at large is slow on the upkeep.) But one space-goer, Canadian astronaut Chris Hadfield, made quite a name for himself last year by turning the International Space Station into a social media hub. His life and times are about to meet a much larger audience as his memoir An Astronaut’s Guide to Life on Earth has been given a pilot commitment by ABC. The Astronaut Broadcasting Company? The 2013 memoir, with a full title of An Astronaut’s Guide to Life on Earth: What Going to Space Taught Me About Ingenuity, Determination, and Being Prepared for Anything, was at the center of a heated bidding war between networks, with ABC coming out on top. They’ve only given the project a pilot order, with no guarantee for the future, but I guess if anyone knows what questionable futures are like, astronauts do. If you’re a regular reader of GFR, there’s a pretty good chance you’ve got a serious nerd crush on Canadian astronaut/former ISS commander Chris Hadfield, whose social media updates from the International Space Station were both fascinating and addictive, all culminating in his covering David Bowie’s “Space Oddity”…from space. If you somehow managed to miss that historic moment, you can watch it right now up top. Well, so long as “right now” for you is within the next few hours of when I’m writing this, anyway. Hadfield announced via Twitter that the “Space Oddity” video would be coming down later today. Are you an astronaut recently returned to Earth’s surface after a long mission in space? Are you finding it difficult to adjust back here on the homeworld? 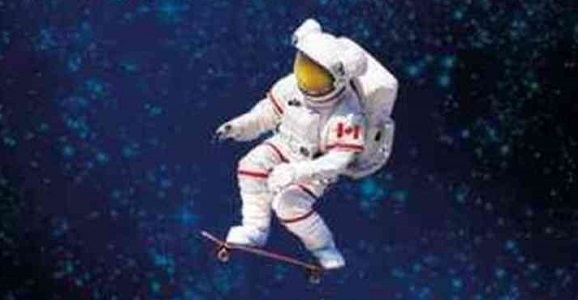 Is your stubborn refusal to remove your spacesuit having a negative effect on your daily life, commute, and competitive skateboarding obsession? Fear not, because Chris Hadfield is here to help. If you’re a regular GFR reader, the name Chris Hadfield probably rings a bell or two. During the Canadian astronaut’s five-month mission as the commander of the International Space Station, he’s become a social media sensation thanks to his videos, pictures, and even songs he’s shared with those of us down here on planet Earth. He’s answered questions we didn’t even know we had. What happens if you wring out a washcloth in microgravity? Been there. Can you cry in space? He doesn’t recommend it. Nachos, however, are a-okay. Well, it’s the end of an era, because earlier this evening Hadfield boarded a Russian Soyuz capsule and began his trip back to the surface, along with American astronaut Tom Marshburn and Russian Roman Romanenko. They’re set to touch down in the steppes of Kazakhstan later tonight. But Hadfield had one last treat for us, seen up above: a cover of David Bowie’s “Space Oddity”…from space!